Author: Menzel, Peter Set In . . . In an unprecedented effort, sixteen of the world’s foremost photographers traveled to thirty nations around the globe to live for a week with families that were statistically average for that nation. At the end of each visit, photographer and family collaborated on a remarkable portrait of the family members outside their home, surrounded by all of their possessions?a few jars and jugs for some, an explosion of electronic gadgetry for others. 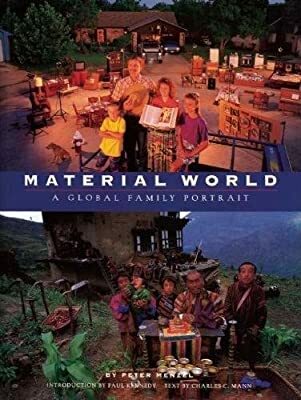 Vividly portraying the look and feel of the human condition everywhere on Earth, this internationally acclaimed bestseller puts a human face on the issues of population, environment, social justice, and consumption as it illuminates the crucial question facing our species today: Can all six billion of us have all the things we want?